Over these past couple of weeks, I have learned a great deal about the City Beautiful Movement as well as what it means to be a digital historian. Digital technologies have developed so quickly over the past couple of decades. In the edited collection, History in the Digital Age, many chapters underscore how technology is used to make traditional methods easier. In order to make our research easier, for example, we learned to use Zotero. According to Cohen, Zotero is a software that allows users to build, organize, and annotate their own research collections with a high level of integration with online texts and databases. In other words, Zotero allows users to easily save citations off the web and collaborate with other researchers. In addition, technology makes information accessible from various places. For example, with the cloud, we can have access to our research from anywhere with internet access. This snapshot of the Omeka Website I made for Mary Sachs. for more advantaged web creators. However, they note that the most fundamental rule for all historians to follow is to design a website that is appropriate for the website’s content and purpose. The purpose is the most important thing to keep in mind when designing the website, but it also still important to remember a person’s skill level when it comes to making a website. All of these factors need to be taken into consideration when trying to format a way to share information. While it can sometimes be difficult to know what the best technology is to use, digitizing offers many advantages to help the public. For example, Cohen and Rosenzweig point out that digitizing allows for resources that are physically fragile to become more accessible to the wider audience. The public often appreciated getting resources online that they might not otherwise have access to. For example, sometimes it is difficult for high school students to be able to go to an archive. Therefore, students often rely on online material for research. The more that is digitized, the more information there is for the public to have access to. Through our research and experimentation, we have learned some easier ways of putting information online for the public. For example, we learned how to use a CSV import to quickly and effectively place Dublin Core source information online with our items. In order to do this, we typed the source information, including the title, publisher, creator, etc., into an Excel document and then saved it as a CSV. This allowed us to upload all the information at one time rather than doing each object individually. I was able to use this technique for my final project. I had 24 items that I wanted to include into various Omeka collections, so the CSV import made my life a lot easier by allowing me to upload all the information at one time. This is a portrait of young Mary Sachs. 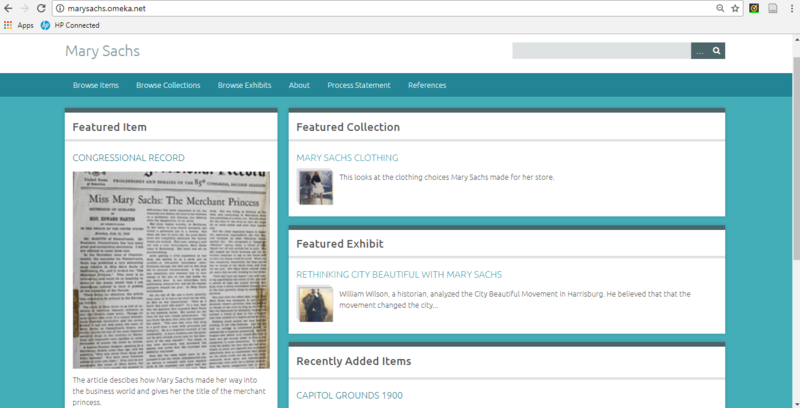 My final project was on Mary Sachs, a Jewish woman, who was part of the City Beautiful Movement. She was known for being one of Harrisburg’s greatest philanthropists. She devoted much of her time to making Harrisburg better. However, arguably, the most important thing Sachs did for the City Beautiful Movement was being a business owner of a clothing store. 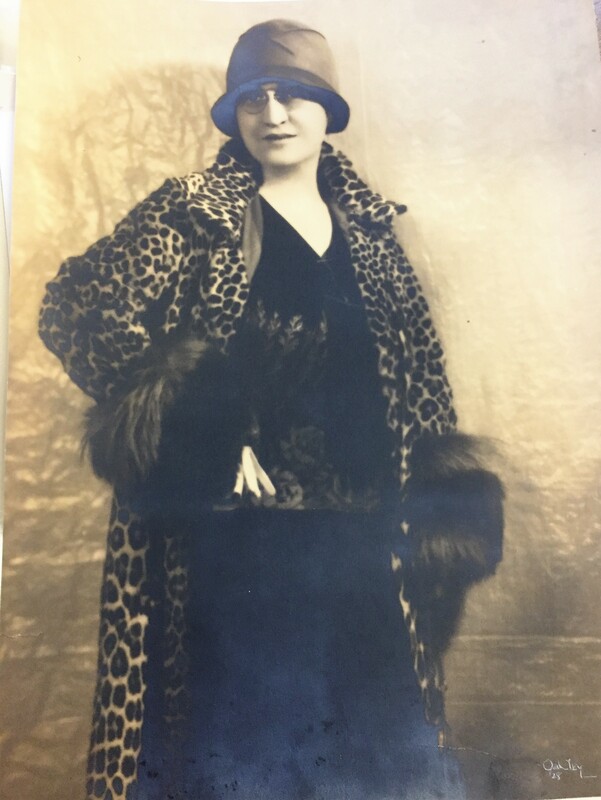 She owned and ran Mary Sachs, Inc. which brought beauty to Harrisburg. Sachs rebuilt the the store after a fire to make it look more visually appealing. In a way, Sach’s fashion store was consistent with the impulse of the City Beautiful Movement — to clean up Harrisburg’s dirty streets. However, her store brought a new and different kind of beauty to Harrisburg through clothing. There were many people who loved the clothing designs and would come from all over the East Coast to see the store. Plus, the citizens of Harrisburg looked better dressed in Mary Sachs’ clothes. It brought a new air of sophistication to Harrisburg.